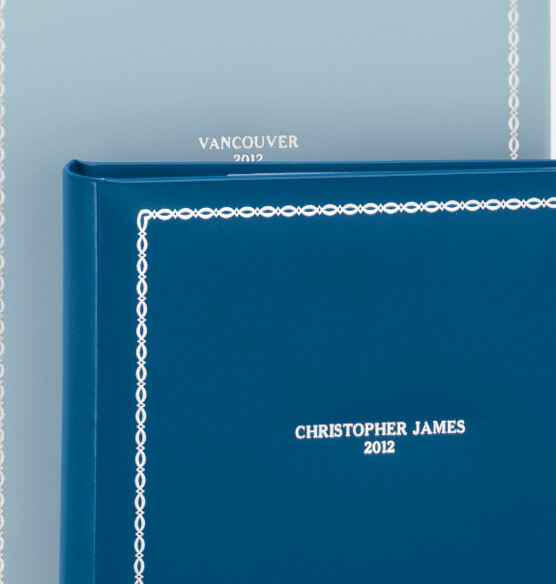 There is so much you can do with this Felicity medium personalized photo album. Create individual albums for every special event, including family gatherings. Keep track of a child's growing years all the way to high school graduation. Or, make an easy scrapbook using the lined memo sections. With 50 book-bound pages, possibilities are endless. 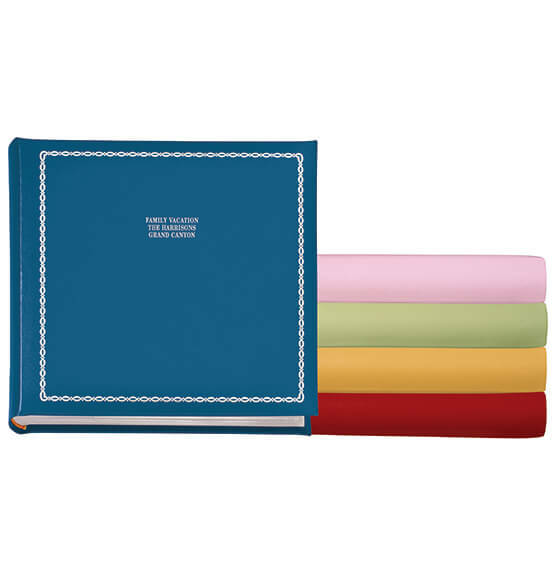 The wrapped leather cover comes in an array of fun, contemporary colors, making this album a joy to display. 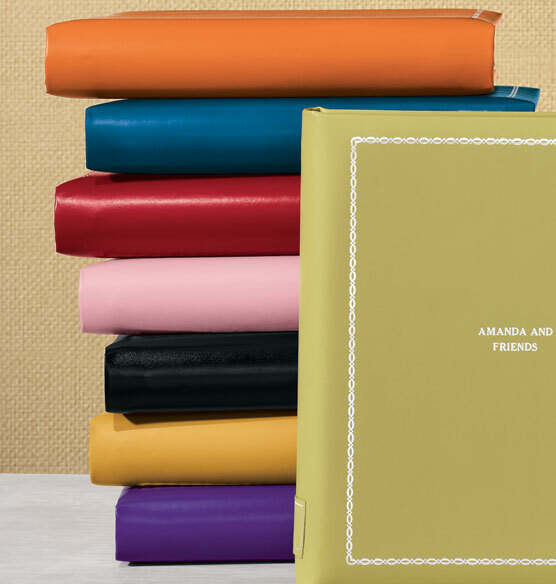 Customize the cover with a family name, dates or other information. Text complements the silver tooled border accents. I do this instead of scrapbooking. THe meno lines are great to document events and moments. Glad they are keeping these around as I will need LOTS more! I have purchased many different albums over the years from Exposures and I have not had problems w/construction or sturdiness...unless someone accidentally grabbed the book from a flap and let it drop & with the weight the spine comes unglued, Then, you just glue it back! Otherwise, well constructed, love that I can color code the baby books for my now young adult boys' and the books can be personalized so we can remember events! Same product for less in stores! I have ordered albums through Exposures before and was always very happy. This was a terrible experience. I chose to pay extra and get an album that has sleeves for pictures not just the "pinching" that is used in between the photos. These tear and photos fall down. I looked all around before ordering. I assumed, my mistake, the album would have individual sleeves as all my previous ones did from Exposures. They did not. It was the style that just has 2 points that are pinched together and several were already torn when I opened it. Should have returned but anxious to get photos and narrative in so kept going after gluing the plastic protective cover together where they (3) had separated. Then by the time I had over 100 pictures in there were 15 pages that were bent and wrinkled. This was an absolute waste of [$]. Could find the exact same product, probably in better shape, at many stores. Extremely poor quality--do not order. I have ordered 9 Felicity albums over the past few years for my children and have loved the look of them. The spine patches are so helpful and each child having their "own" color has been great when we go to look at our photos. I also have loved that they all match; they just simply look great on a bookshelf. I have spent the extra money on these albums to ensure that my children's photo albums are of good quality to withstand years of page flipping. I have over the years, however, grown increasingly dissatisfied with your product. I kept ordering because I wanted the children to all have a matching set of albums. I have now gotten to the point I will no longer order our children's albums from your company. Out of the 9 Felicity albums we own, 5 are for the most part ruined. You might think that it is because of improper use and that the children are rough with them. This is not the case. Because they were so expensive and because it takes me so long to insert pages and write captions, I do not even allow the children to look at them without my supervision. I do not even allow them to hold them on their own. I have been so worried that they would ruin them, but the books have been of such poor quality that even an adult holding and turning the pages has caused them to fall apart. I am happy to send pictures if you would like. I just am so disappointed that after spending so much money on each album that I only have 4 that are in good condition. I have concluded that your albums are just basically terrible. It is just really disappointing. You really do need to look at your product and make some real changes if you are going to charge so much. The ones I have from Target have held up for much, much longer and because they were cheaper from the beginning I have let the children hold them and turn pages because I knew if they fell apart it wasn't such a financial loss. I never would have guessed that the ones I purchased from you would have been such an inferior product. Please remove me from your mailing list as I will no longer order from Exposures. I was very disappointed in the color. BEST ANSWER: Thank you for your question. The green album in the front is the lime. We hope this information will be of help to you. More of a green yellow, definitively not mint green and too yellow to be lime green. Light chartreuse yellow in this picture; in other pictures it looks more like pear. how are the pictures kept in place? BEST ANSWER: They are kept in clear pockets. I have a number of the felicity albums and they are great ! can we get a bigger patch for the cover on the Felicity Album? BEST ANSWER: Thank you for your question. Unfortunately no, we cannot make the personalization larger. We hope this information will be of help to you. what size photos dos it fit? BEST ANSWER: Thank you for your question. The memo album fits 4 x 6 photos. 3 x 5 can also fit but will be loss and easy to move around. We hope this information will be of help to you. I see that the description for the felicity medium album says it can hold 2 horizontal photos per side, but the picture has 1 horizontal and 1 vertical photo per side. Can it do both? BEST ANSWER: Thank you for your question. The picture show holding the photos is actually the large album. The medium album can hold two horizontal photos or one vertical photo per page. We hope this information will be of help to you. What color is this line of personalization pictured above?